Irredeemably bad video games are a simple, tidy affair. Their badness is straightforward. The game stinks. It was a waste of time to play. Probably shouldn't have even finished it. It is different and perhaps more frustrating to play a promising game that starts well, carries many great ideas and then stumbles. 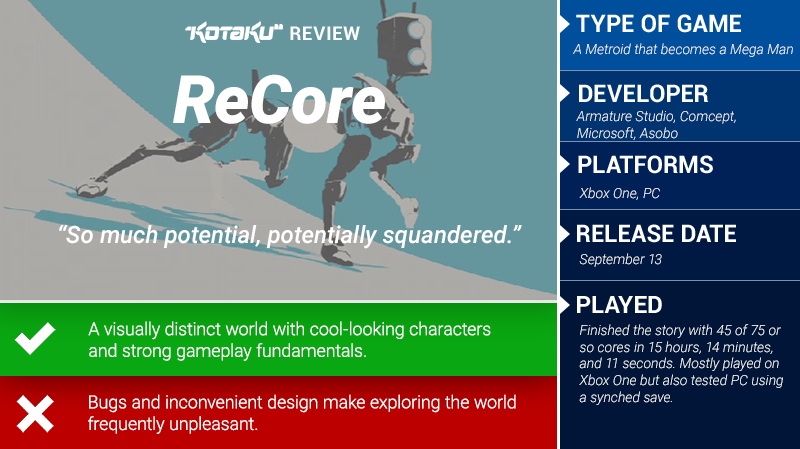 The new Xbox One and PC action-adventure ReCore is one of those second types. ReCore starts beautifully, putting its player in control of Joule Adams, the lone woman on an intriguing, desolate desert planet called Far Eden. Before her is a vista full of cliffs, dunes and massive, wrecked terraforming machinery waiting to be climbed and explored. Gameplay possibility stretches past the horizon. Things don't go wrong until much later. At the start, ReCore is a pleasure. 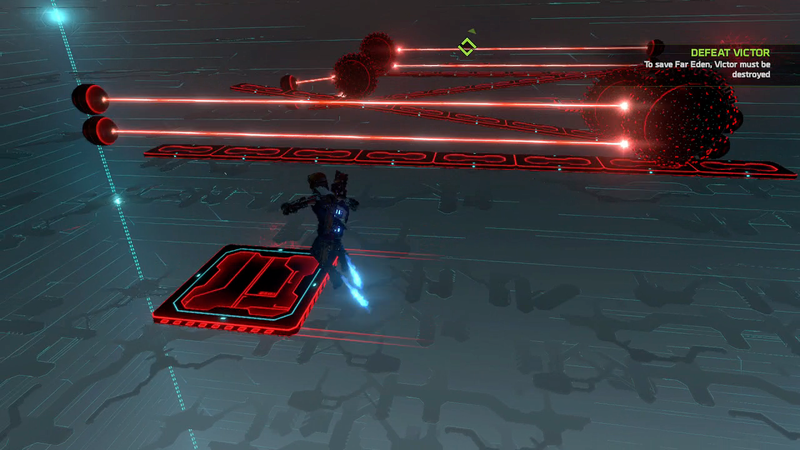 Joule's jumping and shooting controls are snappy. Her robot dog sidekick is cute and useful. Far Eden looks lovely. Each cavern, early on, looks distinct. Enemy designs feel fresh, too. The game brims with mysteries. There are open spots in the menus that will doubtless be filled with new weapons and robot pals. There are suspicious spots in the environment waiting to be poked. Conspicuous vents on the ground shoot hot air toward the sky. What is their purpose? Massive rail tracks line the sides of buildings and float in the sky. You may safely assume that all of these things will have meaning and can be interacted with eventually. That's how games work, especially games that were made, largely, by the lead architects of Metroid Prime, a trilogy that ranks among the best exploration and discovery games ever made. Sure enough, you will find a second robot buddy, one shaped like a spider that lets you use those mysterious rails. 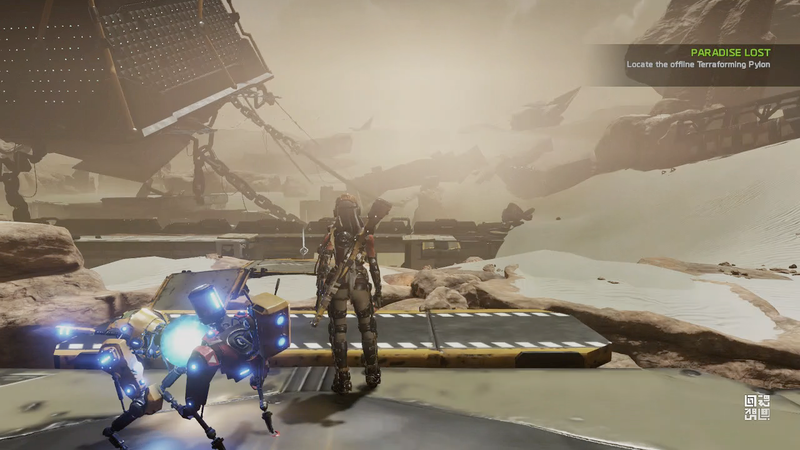 There's your first upgrade that lets you access more of ReCore's world. The rest of the game, you might assume, will move in a similar direction. ReCore isn't a skill shooter. 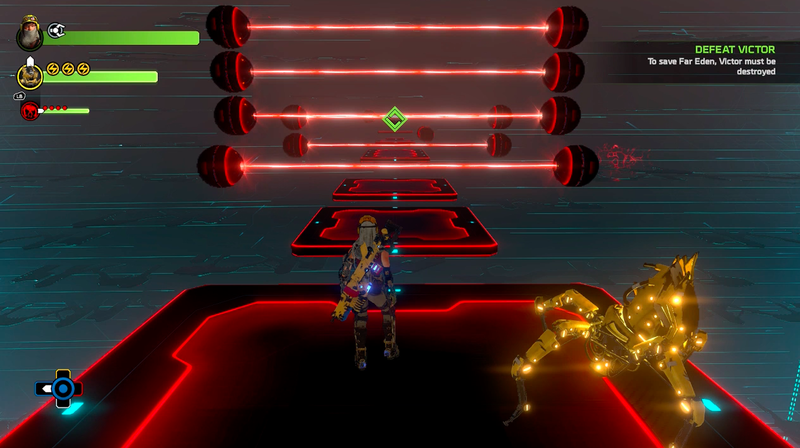 It's more of a puzzle-shooter, as were the Primes, challenging players to switch to lock onto targets and select the right armaments to clear out the robot enemies who keep emerging from Far Eden's sand. There's a colour-matching system. Use the red, blue or yellow lasers that you acquire to most effectively damage red, blue or yellow enemies. The ally bots participate in battle, too. Joule can juggle, say, the dog and spider robot buddies in and out of battle, one for the other, calling in their heavy attacks. Joule can also cast a line at weakened enemies and fish out their cores after a brief tug of war. All of that works in concert to makes every encounter an interesting, fast-paced strategic fight. 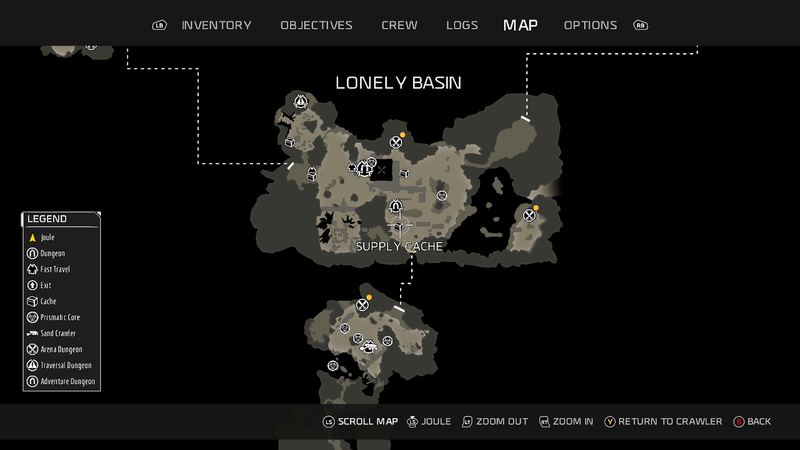 In ReCore's first few hours, the map unfurls and becomes dotted with areas of interest. The main storyline is a thin, unobstructive drama about finding other living people. It serves the purpose of pulling players across the map and toward the entrances to brief, fun linear dungeons. The more you play, the more technical problems emerge that hint that something has gone wrong in the making of ReCore. The game's loading times on Xbox One are distressingly long, forcing one- or two-minute waits when travelling between some areas or when waiting to respawn after an enemy kills Joule. (She comes back in just three seconds if she dies from falling.) Load times are notably faster on PC. 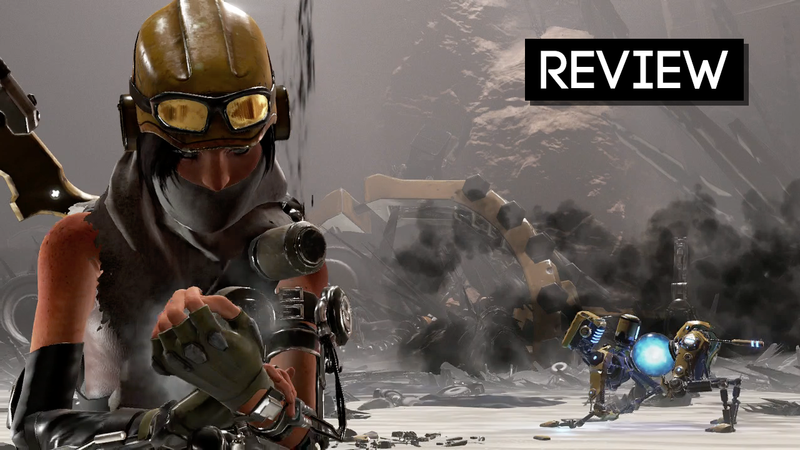 ReCore is designed for backtracking and discovery but struggles to support curious players. 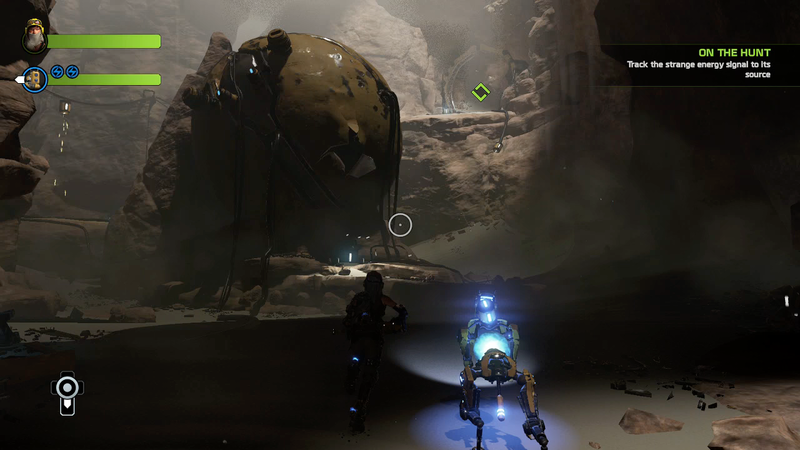 The game's map suggests it is built for exploration, as does ReCore's gradual delivery of new traversal abilities, which unlock each time Joule gets a new robot buddy. 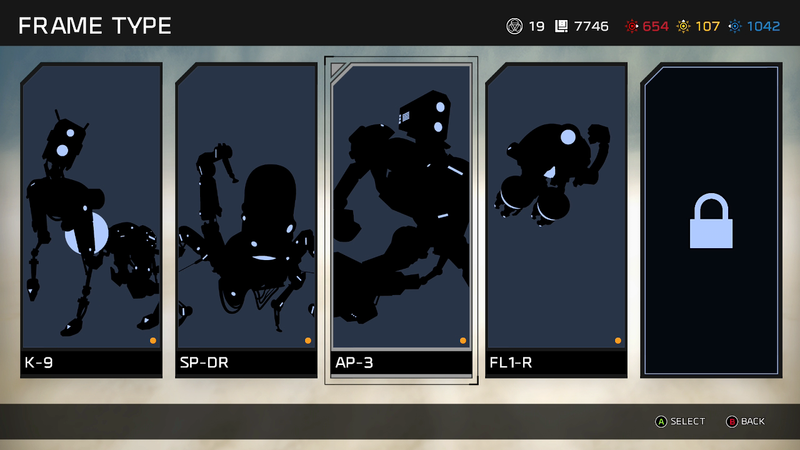 You gain access to four bots who each have key exploration abilities, but can only bring two into the field. This is a baffling limitation. You risk venturing into some corner of the map without the bot you need to gain an item. Maybe you need the ape bot to bash some rocks, but you brought the dog and the spider instead. You have to walk to a fast-travel location or warp back to HQ to swap in the bot you need, then go back to where you were stymied. It'd be like a Metroid game requiring you to use the ice beam to access a remote treasure but limiting the size of your inventory so that you might have left the ice beam back in your spaceship. Gotta go back and get it! Needless to say, it's frustrating. My spider-bot here can't smash this rock. Nor can the flyer bot I brought in reserve. I needed the ape bot. Time to warp back to HQ. Then comes the game's second half, when it turns from Metroid to Mega Man. That is not inherently bad, and it may thrill some players. It's even thematically suitable, given that one of the studios that made ReCore, Comcept, is lead by Mega Man creator Keiji Inafune. The difficulty spikes wildly, and suddenly Joule is falling to her death a lot. She'll be slaughtered in combat arenas, unless you've gone back, ground out some surplus kills and leveled her up. One combat challenge on the game's second floor took me over an hour to clear, far longer than any challenges beyond it, including the final boss. The tower is Mario; the open-world is Zelda. 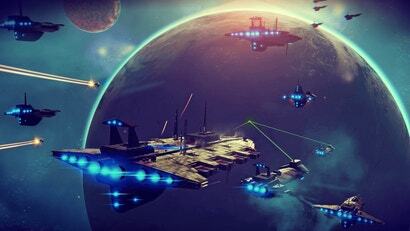 It caters to twitch players, whereas the open world catered mostly to strategic players. It's a jarring shift in the game's design, and makes the whole of ReCore feel padded and bolted together. It's an anticlimax, as well. These floors full of platforming challenges don't come off as a capper but as a tangent into another game. The worst thing about the tower is that it accentuates ReCore's inability to smoothly support the exploration-based gameplay that it promises from the beginning. Each floor of the tower is locked until the player collects five prismatic cores from elsewhere in Far Eden. To get those cores, you must travel back into the game world and hunt for them. This is a mandate to backtrack, to hunt for hidden objects, to explore. Cores may drop from special enemies you find in an unexplored pocket of the desert. Others may be granted by completing optional dungeons hidden in the game's cliffs. There are prismatic cores to be found! It's not that hard to find individual cores, but it's needlessly arduous in the back half of the game. It's during this phase that I wrestled most severely with the problems of showing up somewhere with the wrong bot. It's during this phase that the load times interfered with my zeal to discover each cranny of the world. 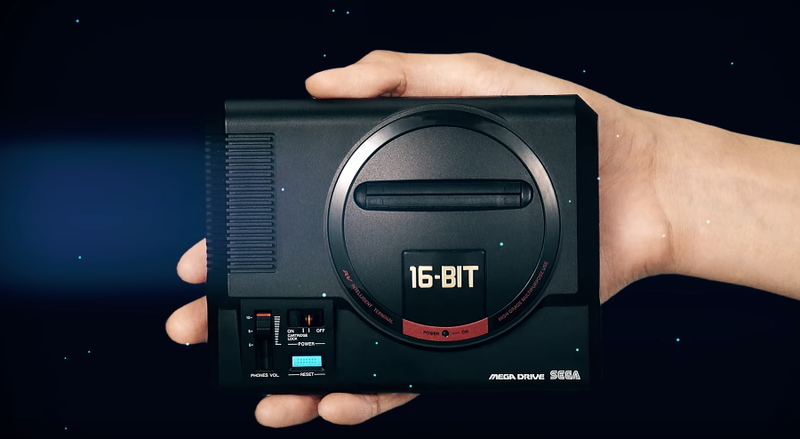 And it's here where bugs and odd design decisions really got annoying. Twice I went into dungeons that held cores and ran into glitches that forced me to restart the game. 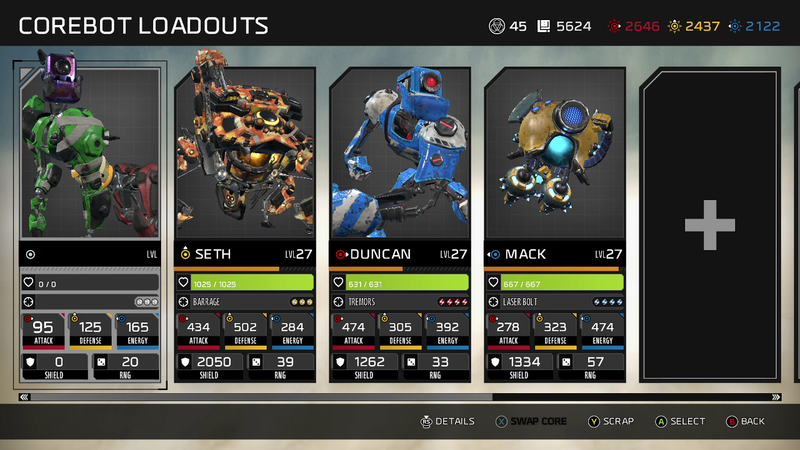 In my dozen hours with the game, too many bugs accumulated on ReCore's windshield: two crashes, one fall through the world, one icon for a collectible on the map not disappearing after I got it, one main mission objective repeatedly returning to my screen hours after I'd accomplished it, one instance where my bots disappeared, one instance where the switch I was shooting didn't recognise my shots, two instances of special key-like bots plugging into the wrong keyholes but the locked door opening anyway. I've experienced some of these types of bugs in other games, of course. But when taken together, they contribute to my sense that something went wrong when they were making this game. 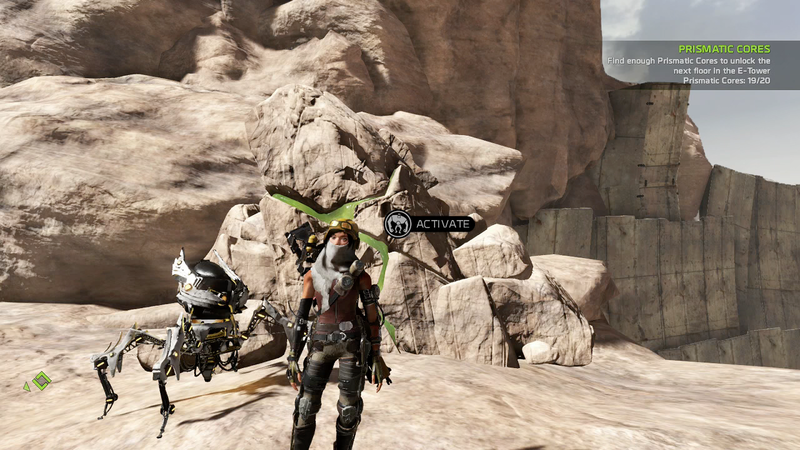 ReCore's robots are great. They're helpful in combat and have cool extra abilities. Oddly, the fifth frame, a tank, isn't in the game yet. A Microsoft rep tells Kotaku: "The Tank is not currently available in the game. But please stay tuned for news." Collectible bluepirnts let you power up and customise your corebot frames. My dog frame here is a hodgepodge, but the flying frame for Mack uses a full set of matching pieces, granting a stat boost. 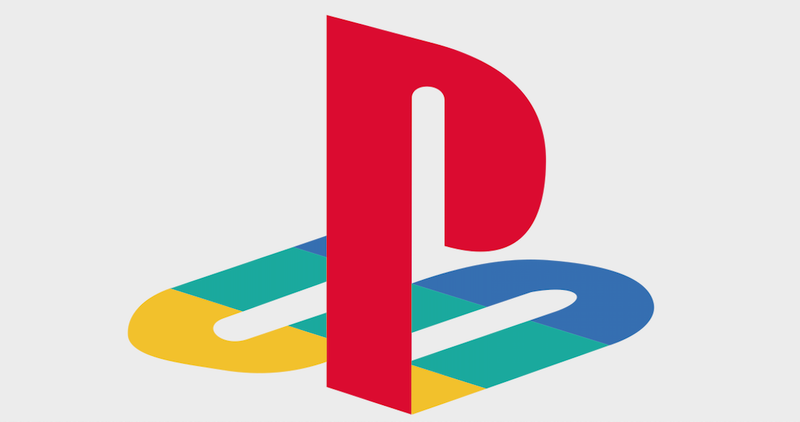 In modern gaming, potential is never completely squandered. Even a day before the game was out, a spokesperson for the game's publisher, Microsoft, said the development team is "committed to improving where we can." A big patch that shortens load times, squashes the bugs, makes the map more usable and even allows all of the bots to be swapped in and out at will could address a lot of ReCore's problems. Perhaps, at some point, ReCore will be worth backtracking into to explore some more. I began ReCore having a marvellous time. By the end, I had begun to resent it. It wasn't that I felt rushed; I allowed myself extra days to play. It was just that the game is such a heart-sinker. It was created by people whose work I've greatly respected, but ReCore just doesn't feel ready for all of us to be playing it. is this still only available via the MS store? well via the MS store you get it as a playanywhere title. One purchase gives you Xbox and PC with save file sync. ...If you've got Windows 10 (which you need to play it) then surely you'd already have some kind of Microsoft account? I do not, I use a local account on my PC. The majority of MS products I use aren't technically mine, I am authorized thanks to work and have access to MSDN or volume licensing. It is so foolish to get games on release these days. Even games with great promise are extremely likely not to achieve most of their potential until several patches in. By then, you might be done with the game, soured or indifferent, or simply moved onto other games and robbed yourself from experiencing the best game that title could be. You literally lose nothing by waiting a few months (it's not like there are no other games to play!) and potentially may gain a lot. Agreed, I stopped pre-ordering & purchasing games on day one years ago. I also now don't purchase games like Fallout 4 or The Witcher 3 until all DLC is released in a GOTY edition. I never buy into gaming hype so I'm fine waiting for any game for a couple months or even a year. I have so much games in my back catalogue that I never have nothing to play. I mean they aren't pulling an EA and charging 20 dollars for an hr worth of content. I mean you can easily squeeze 15hours out of Blood & Wine depending on how complete your run is and what difficulty you are on. I've got to the point of only buying online games where you'll be at a disadvantage later compared to day one. I did however buy recore. Looked fun, and I wanted to test out the whole playanywhere game thing with xbox and PC. Plus I had a heap of Microsoft credit I bought on sale. And even if the game hasn't necessarily improved, the price will likely have dropped enough for you to perhaps not mind the flaws as much. What a shame. The concept looks great. Too bad they couldn't pull it off. Honestly, they pulled it off well enough to enjoy. If you truely think the concept looks great, then I would highly recommend picking this game up. I can understand some of the problems that people have mentioned, but they aren't that big of a deal unless your looking for filler material for an article that you are writing. I really hope the devs stick with it and tweak it to make it better. I've played a couple hours and love the ideas, but everything I've read has really put me off. I don't want to resent this game. Give it a few months I guess, cross my fingers and hope it gets better. I wouldn't disagree with the faults presented in this review, but I don't feel that had that big of an impact. Really my only major issues are that it's a bit short and the tower is mostly filler platform jumping content. I didn't struggle with it but as a Mega Man fan I'm used to timing jumps onto vanishing platforms. Overall I really enjoyed it. They didn't try to pass it off as a AAA game and I can respect that. Finally a comment by someone who actually played the game and didn't have to impress with an article. The game is good and is rather fun and enjoyable for what it is. I hope to see a sequel of sorts. I don't much like the statement 'it's good for what it is'. Polio is good for a virus, but I don't much want that either. Bought the game on Friday, put ~13-14 hours into and am nearly ready to take the final room. Enjoying the combat and the platforming, but the load times are pretty awful. When I've been doing exploring now I just take the Spiderbot and the Flier, as Mack (dog) is pretty useless and there are very few places to use the AP3 bot. Worst part was in one dungeon there's a save point right where a rolling ball is, and you die repeated over and over until you can manage to boost backwards and hopefully get a different spawn. The game play reminds me of Too Human in it's simplicity, and I actually mean that in a good way. The only kicker is that dying often feels cheap as the only times I've been killed in combat have come from when multiple enemies stun-lock me. It's pretty fun now and if they sort out the load times and spawns I could easily recommend it . Sounds like I wait for a sale or Games with Gold.